Stylish! 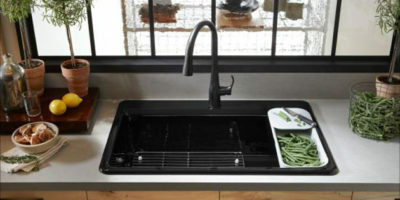 We’ve reviewed Kohler Bellera as one of the best pull-down kitchen faucets for our homes. Let’s go through all the features in 5 sections. That faded-shine color you see on this faucet is officially known as vibrant stainless steel and there’s more to it than just the outwardly appearance. 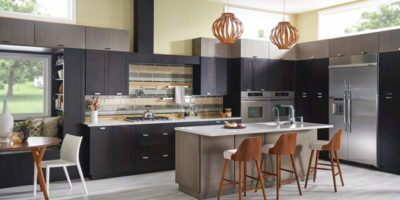 Yes, it looks extremely good, sporting what falls nothing short of a luxurious look and feel, but this design, style, and color scheme has a lot of significance to the maintenance of the unit. The manner in which the vibrant stainless steel finish was achieved involves a process which makes the robust coating of the unit well, stainless. Nothing seems to stick to it, whether it’s dirty hands, hot bits of food which are known to very sticky, or anything else really. 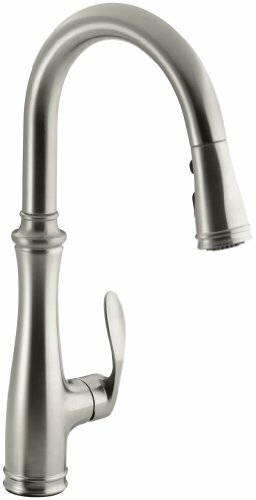 The base material of this one-piece kitchen faucet is metal, with the vibrant stainless steel finish discussed and a color scheme named after the finish. This can be said to most closely resemble what would be considered to be a traditional kitchen pull-down faucet, but when you take into account the shape, build, and the color finish, it’s a traditional style which fits perfectly into the contemporary home. Somehow this design and style seem to work well in more classically styled homes with a lot of character and quaint charm. The “vibrancy” in the vibrant stainless steel finish is probably what makes it work just as well in a more retro-styled home as it does in a contemporary-style kitchen. 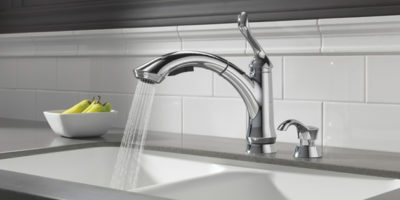 Because of its traditional style in its design and appearance, and its simple one-piece build, it would be very easy for someone to take one look at this faucet, admiring it only for its sheer beauty, but a whole lot more goes into making it one of the most feature-filled drop-down faucets around. “Under the hood” if you like, the trio of features which make this one of the best faucets around includes what Kohler calls their DockNetik System, ProMotion Technology, and the MasterClean Sprayface. What does all of this mean, though? What these fancy names translate to in features includes a magnetic-based docking system, which is situated inside the spout. The unsuspecting user would naturally not be able to sneak a peek at this, but what it does is it locks the spray head very securely into place. This comes together with a very lightweight hose with some braiding, making it quiet to operate while it swivels on a ball joint to just make handling that much easier and a lot more comfortable. These features are topped-off with a spray face that does very well to completely avoid the building-up of minerals. Of all the traditional-looking pull-down faucets featured, this one’s cost sits near the top, probably because it conceals the hidden feature of the pull-out hose. This has some implications for the installation process, which is easy enough to figure out for professionals, but DIYers must take extra care. It is indeed dock-mounted, but the documentation for its mounting could have been illustrated much better. The innovative and sleek features aren’t just for show and outward styling with this faucet. Each design feature doubles-up quite nicely to depict some good value in the unit’s functionality, making the Bellera pull-down faucet function well ergonomically and mechanically. 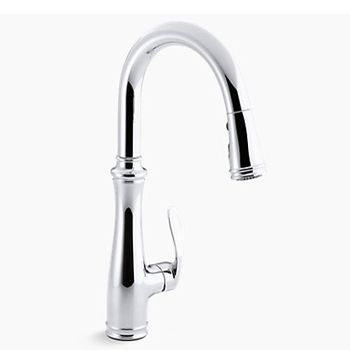 The high-arch profile of the way in which the spout was designed is one such example of the functionality which comes bundled in with ergonomics. It can rotate fully at 360 degrees, which is some design genius considering anyone who is washing different sized pots. It can reach over some of the tallest of these posts, and let’s face it, isn’t that what drop-down faucets are really for? 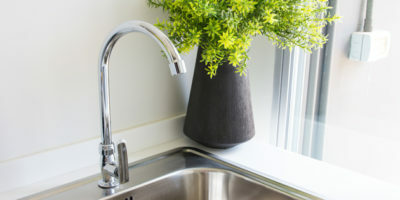 In addition, the spray head (which features three built-in functions) can be pulled right down into the kitchen sink, which is a feature that reveals a somewhat hidden function of this being more than just a solid faucet. This allows users to bring the pressured water spray as close to whatever they’re washing inside the sink as possible, or perhaps to fill a pot, etc. One handle makes it easy to operate, with this ease of operation literally spilling over to manipulating the breeze and the water temperature. The three functions of the spray-head include the Stream, which is just great for filling up different types of sizes of your pots and pans, Sweep Spray, which essentially just creates a broad and powerful stream of water (great for a superior clean), and the Pause function, which as you might have guessed allows you to stop the flow of water quickly while you switch between your kitchen tasks. A vibrant stainless steel finish means the coating is made of non-stick materials, so maintenance is virtually non-existent here. The mineral build-up is extremely slow and minimal, but if you perhaps want to clean it (after ten years maybe), it’s still breezed.